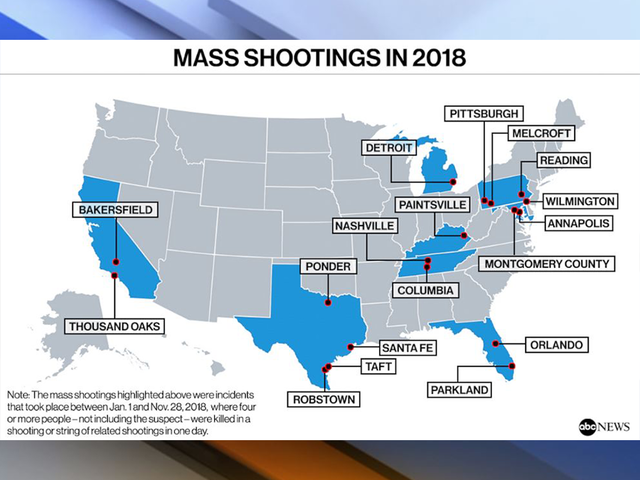 Some of the deadliest mass shootings in the U.S. this year prompted widespread national horror, including the Parkland high school shooting and the massacre at the Tree of Life synagogue in Pittsburgh. News of other mass shootings, however, seemed to have only reached local audiences. There were a number of incidents where spouses or former spouses killed their partners (and sometimes their children) in Texas, Delaware, Tennessee, Maryland and California. The FBI defines a mass shooting as an incident where four or more people -- not including the suspect -- are killed. While there is no publicly accessible federal tracker of such incidents, various groups and watchdog organizations keep their own lists, often using different definitions of what qualifies as a mass shooting. For the list compiled by ABC News below, the incidents took place over the course of one day and involved four or more victims, not including the suspect. For instance, shooting sprees that spanned longer amounts of time were not included on this list. As of Nov. 28, there were at least 18 shootings that fit these parameters. There are hundreds of other deadly shootings that took place across the U.S. this year that don't fit these conditions, including some that received national attention, like the shooting at a Maryland Rite Aid, or the shooting at a Chicago hospital. In both of those incidents, three victims were killed and the respective suspects also killed themselves. But whether they made national headlines or not, the common, heartbreaking thread among the 18 incidents below was that they happened in the first 11 months of 2018. Four people were killed in a shooting outside a self-service car wash in a rural western Pennsylvania town when a man wearing body armor and wielding three guns, including an AR-15 semiautomatic assault rifle, opened fire on them, according to Pennsylvania authorities. The shooting in Melcroft in Fayette County, about 55 miles southeast of Pittsburgh, occurred at 2:52 a.m. and was described by the local district attorney as a "horrible and senseless event." The suspect in the shooting of four people at a Reading apartment complex is still at large, authorities said. "We cannot remember any time in recent history when this many people were shot at one time," James Marasco Jr., the deputy chief of the Reading Police Department told the Associated Press at the time. Capt. Paul Reilly of the Reading Police Department's investigation division told ABC News that as of Nov. 26, there have been no arrests and it is still an open investigation. They do not believe it was a random shooting, Reilly said. The suspect who killed his parents, his girlfriend and her mother allegedly struggled with drug addiction before the shooting, his pastor told The Lexington Herald Leader. The suspect, identified as 45-year-old Joseph Nickell, killed himself after he killed his parents, James Wayne Nickell, 75, and Arlene Nickell, 70; his girlfriend Lindsey Vanhoose, 41; and her mother Patricia Vanhoose, 57. The shooter's teenage son was reportedly at his grandparents' home where the first shooting occurred and escaped before calling 911, the paper reported. The deadliest shooting of the year took place in Parkland, Florida, when a former student opened fire and killed 17 students and school staffers. The suspect, Nikolas Cruz, fled the scene and was later apprehended by authorities. He has been charged with 17 counts of murder and 17 counts of attempted murder in the school shooting, and is now facing new charges after allegedly attacking a deputy in jail, according to ABC affiliate WPLG. The massacre prompted survivors to launch a national movement and Florida to change its gun laws. Held a month after the deadly shooting, the March for Our Lives became a national event and some of its student organizers -- including Emma Gonzalez, David Hogg and Jackie Corin -- have become widely recognized figures in the fight for gun reform. The group also launched a national bus tour to try to get other young people involved. A man pulled up to a car at a Detroit gas station and opened fire on his child's mother, Ciera Bargaineer, after an altercation. The suspect, George Davis Jr., killed Bargaineer, another woman who was in the car with her, 21-year old Kristin Thomas, and Bargaineer's father, 60-year-old Raphael Hall, ABC affiliate WXYZ reported. Davis then reportedly fled the scene and fatally shot his cousin at a home about two miles away, according to WXYZ. Davis shot himself after leading police on a chace, the station reported. A bystander a deadly massacre at a Waffle House. James Shaw Jr., 29, confronted the gunman, took his gun, threw it over a counter and forced the gunman outside. The suspect, Travis Reinking, who was later apprehended by law enforcement officers and is now facing four counts of criminal homicide. Four people were killed: Taurean Sanderlin, 29, a cook at the restaurant who was on a cigarette break and was one of the first slain in the shooting; DeEbony Groves, 21, an honor student at Belmont University in Nashville; and Akilah DaSilva, 23, a Middle Tennessee State University student. The youngest victim was 20-year-old Joe Perez, whose mother wrote in a Facebook post, "Me, my husband and sons are broken right now with this loss. Our lives are shattered." A woman, identified as Amanda Lee Simpson, survived a shooting where she says her ex-husband Justin Painter killed their three children and her then-boyfriend, according to The Dallas Morning News. The victims were identified as 29-year-old Seth Richardson, and Odin, 8, Caydence, 6, and Drake Painter, 4. Simpson told The Huffington Post that Painter told her that he was intentionally letting her alive to live with the pain of losing her children. Gov. Greg Abbott called the shooting, where 10 people were killed and 13 others injured, "one of the most heinous attacks that we've ever seen in the history of Texas schools." Four young children were fatally shot by their mother's boyfriend and the suspect shot an officer in the head after police responded to the scene. Orlando Police Chief John Mina said the suspect, Gary Lindsey Jr., was the father of two of the children -- Dove Lindsey, 1, and Aiden Lindsey, 6. He allegedly killed them along with the other two children in the home -- Lillia Pluth, 10, and Irayan Pluth, 12 -- in the altercation. Lindsey then killed himself at the scene. Orlando Police Department officer Kevin Valencia was shot in the head and remains in a coma more than five months after the incident, according to a spokesperson for the department. The suspect, armed with a shotgun, looked for victims in the newsroom of the Capital Gazette, a daily newspaper in Annapolis, which is located in the first floor of a multi-office building, Anne Arundel Police Department Deputy Chief Bill Krampf said at the time. Rob Hiaasen, 59, Wendi Winters, 65, Gerald Fischman, 61, John McNamara, 56, and Rebecca Smith, 34, all were shot to death, allegedly by 38-year-old Jarrod Ramos, who had a longstanding feud with the newspaper and has been charged with five counts of first-degree murder. A man in Wilmington shot his wife and three children before shooting himself, the Delaware State Police reported. Julie Edwards, 41, and a 6 year-old boy, a 4 year-old girl and a 3-year-old boy were all killed by Matthew Edwards, 42, authorities said. The case was ruled a murder-suicide by the Delaware State Police. A man killed his 85-year-old father, 60-year-old stepmother, her 41-year-old son and the couple's adopted 13-year-old son before turning the gun on himself, according to the Alice Echo News Journal. The two sons, Roel Mireles, 41, and Isaiah Starry, 13, were found shot dead at their parent's residence and their parents, Ernest Starry and Thelma Montalvo, were found dead at a nursing home in Robstown, Texas, alongside their suspect son, Richard Starry, the paper reported. A man shot his ex-wife and four other people, some of whom appeared to be responding to his first gunshots, in Bakersfield. ABC-owned station KABC reported that there were two separate but related shootings before the suspect shot himself when he was confronted by a sheriff's deputy. The suspect, Javier Casarez, killed his ex-wife Petra Maribel Bolanos De Casarez. Their divorce was finalized in June, months after he claimed in court that he believed his wife was cheating on him, according to KABC. A father fatally shot his wife, his 10-year-old son and his 22-year-old stepdaughter before killing himself at their home in their Montgomery County, Maryland. He also shot his 11-year-old daughter, who died three days later, according to NBC Washington. NBC Washington reported that the suspect, Yong Mun Kim, left names and phone numbers of relatives for police, which suggests he planned the murder-suicide. A toddler's first birthday party turned deadly following an alleged altercation between two families attending the party. Texas Department of Public Safety officials said that four men were fatally shot and two others were wounded, with two suspects fleeing the scene, the Associated Press reported. A mother killed her four teenage children in their Columbia, Tenn., home before reportedly shooting herself, local law enforcement said. The Tennessean reports that the four children were Bo Li, 14, Meigan Lin, 14, Lia Lin, 15, and Kaileigh Lin, 17. Their mother, Cynthia Collier, 55, was found with self-inflicted gunshot wounds. The Associated Press reported that the bodies were discovered by an adult child who returned home from work, and a local sheriff said that the teen victims had all been adopted and home schooled. Eleven worshipers, including a 97-year-old woman, were gunned down inside the Tree of Life synagogue in Pittsburgh's Squirrel Hill neighborhood in what is believed to be the deadliest attack on Jews in America. "Words escape me of what you can say," said Rabbi Jeffrey Myers, who was officiating a service when a gunman started shooting. "They were all beautiful, wonderful, good decent people. Hate was not in their vocabulary." At least 12 people, including a police officer, were killed when a gunman opened fire in a packed Southern California bar during its "college night," leaving the community of Thousand Oaks in shock and in mourning. ABC News' Emily Shapiro and Bill Hutchinson contributed to this report.